I get offered a lot of different products to review on here, but I only like to use my blog for things I really love (like my Tofu Xpress) and that I would buy whether it was sent to me for free or not. Sometimes that is hard for me because as you probably know, I LOVE free stuff, but my new tiny apartment can only hold so much! Today, I have an amazing product to share with you that it was VERY easy to make room for: The SodaStream Home Soda Maker. It’s actually something I’ve had on my list to get for a while because my parents and sisters all have one and it’s pretty awesome. It basically makes soda water out of tap water and is very compact, easy to use, and economical over the long-term if you drink a lot of seltzer! So when I was offered a free one in exchange for a review on my blog, I happily obliged. They retail around $99.95, which is kind of a lot for a kitchen tool, but I LOVE bubbly water, and with this I’ll never buy a bottle of seltzer again. So I feel like, over time, it’ll pay for itself. Definitely more than I need! The set-up could NOT be any simpler. Step One: Take Everything out of the Box. Step Two: Remove the cap from the carbonating bottle. Step Three: Place the capless carbonating bottle into the top part of the SodaStream. Step Four: Place the top part of the soda stream back into the bottom, with the carbonator attached. Making the bubbly water is even easier. They give you two reusable bottles with the SodaStream, so you fill it up just to the “fill line” with tap water (or Brita). Place it in the fridge until chilled (if desired). To fizzify the water, just remove the cap and screw it into the soda stream. Once it’s attached, you’re literally 5 seconds away from soda water. Press the button on top of the SodaStream. And that’s it! You can press it twice for standard bubbly water, more if you want it more bubbly, or just once if you want a slight fizz. To make flavored soda, you just take whatever flavor you want. Take one capful of the soda mix. And then pour it into the filled, fizzed, bottle of water and you’re finished! I seriously LOVE the SodaStream and have already used it several times since moving in less than two weeks ago! I usually keep both bottles filled in the fridge, one with regular seltzer and one with flavored soda (this one is diet grapefruit). Once I run out of the soda mixes they sent me, I’ll probably just stick with the regular seltzer and add lemon, lime, or citrus to it if I’m craving some flavor. Soda water feels so fancy to me to have at home and to be able to offer to guests – love, love love! So tell me – which do you prefer – fizzy or flat water? Hi! Man, I have been so tired lately even though I’ve been getting plenty of sleep. I think working on the weekends just throws my whole body off because I really need the time to relax and focus on myself and not my job. Luckily I earned a few hours of comp time, so I can take a few hours off one day soon. I’m supposed to go see my sister in Philly this weekend, but I might just stay put it and take it easy, but TBD. I could really use some down time! For an afternoon snack, I had a new-to-me kind of yogurt. So it’s a thick yogurt, similar to a Greek style and still nonfat and creamy. The Whole Foods by me carried it in Plain, Blueberry, Pomegranate & Passion Fruit, and Orange and Ginger. I picked up one each of the last two and will try the other one tomorrow. When I first dove into the yogurt I was a little disappointed because I was expecting it to be like Greek yogurt where the flavor is at the bottom and you mix it into the yogurt. This was pre-mixed so the whole yogurt was flavored. Once I got over that, it was really good. I mentioned I wanted to have a more substantial afternoon snack, so I mixed in two sliced up kiwis and a crushed Weetabix biscuit. And that really made the yogurt! The yogurt is smooth since its premixed so the mix-ins really gave it a nice texture. And, it worked! It kept me full for a few hours, so I came home and worked out and felt great during the workout. I did intervals again today which were killer! I did 20 minutes of jogging for 2 minutes at 5.5mph then sprinting at 7.5mph for 2 minutes. I’ve heard doing intervals can really help with your speed, so I want to find another 5k to run soon and see if I can shave a few seconds off my time. After I did the intervals, I decided to do a little yoga, and I found “Less is More Yoga” on ExerciseTV on Demand. It focused on cardio so the poses kept moving to keep your heart rate up. I really enjoyed the workout and think this is my favorite yoga so far that I’ve found on demand! It was challenging and my heart was definitely beating fast, but I felt like I could keep up which is hard for me since I’m so new to yoga! After that, I was hungry. I had some grand plans to make a big dinner but just wasn’t feeling it, so my boyfriend offered to make us eggs and grits. He did my eggs sunny side up and served them over ~2/3 of a cup of grits. He also made some frozen broccoli and we grated some parmesan over everything. I love when the yolks are runny in eggs and how it oozes all over when you break them with your fork. It made the grits taste so creamy even though there was no butter in them, just water and salt. Mmmm. Eggs make the best quick meal. What’s your favorite way to have your eggs? I love to have a poached egg over salads or in soup or on an egg sandwich with cheese! Today has been kind of a weird day. I was so exhausted after I got out of the course around 3:30 so I decided to come home and nap. I rarely nap in the middle of the day because I’m always working (obviously) and then when I get out of work its usually too late to nap. It always throws me so off because I wake up and can’t tell what time of day it is and just feel lazy afterwards. I definitely need it though because I’ve only slept around 6 hours the last two nights, and I almost always get at least 8 normally. I was thinking about going back to Whole Foods for lunch today because it was such a treat yesterday, but we had less time for our break today so I decided to stay a little closer to the hotel. I took the two course instructors to a little sandwich shop right on the corner, and we got food and sat outside to eat it. I was starving by lunch time, and did end up eating that banana shortly after my last post, so unfortunately that oatmeal didn’t hold me over as much as my normal oats. I think the toppings were good but I needed to add a bit more fruit and/or protein to it. The weather was incredible so it was really nice to get some time outside. The vegetarian options were pretty limited on the menu, but I spotted a Veggie Wrap, and had them to hold the honey mustard, add tons of veggies, and got it with mozzarella cheese for some protein. The wrap was actually really, really good! I was a little worried it might not be that great, but the veggies were really crunchy and fresh, and the mozz was perfect in the wrap. They put in lettuce, tomato, cucumbers, sprouts, roasted red peppers, avocado and the cheese. I also got a bag of popcorn for us to share, but we only got through about half this bag (which had 3.5 servings). The popcorn was really lightly seasoned with salt so it was tasty and crunchy. The cookies from yesterday made an appearance again today, and this time I had one. It was a chocolate cookie with caramel crunch through it and I ate it too quick to snap a picture, but oh man it was good. 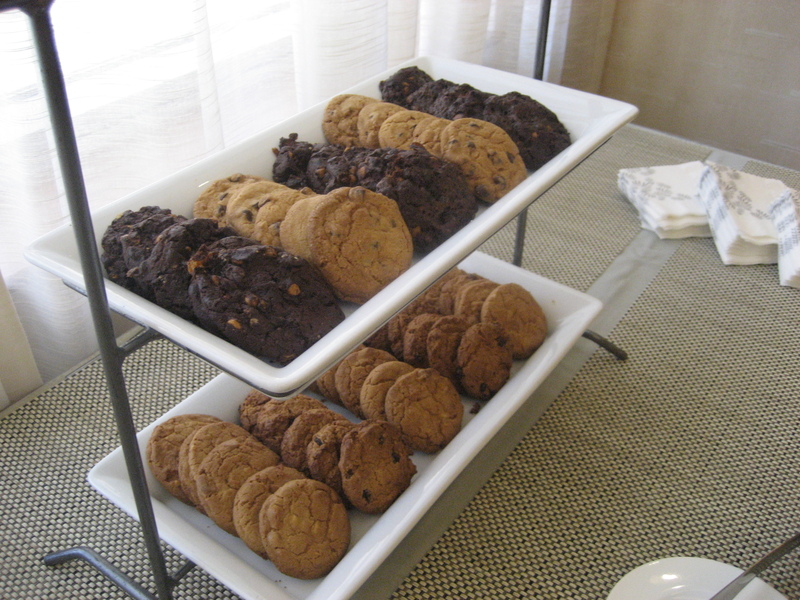 These cookies are going to be around me for the next several days so I have to be careful… But the course is all done now, so now we move into the conference itself. After I came home I passed out for a good 2 hours and then I woke up pretty hungry. For some reason, I never like to buy any yogurt other than nonfat, but in the samples that Chobani sent me, there were two containers of the Pineapple 2%. They actually have the same number of Weight Watchers points as the other Chobani nonfat flavors, so I’m not sure why I shy away so much. The stats are 160 calories, 2.5grams of fat, 0 fiber, 13grams of protein. I ended up mixing in some chopped kiwi and a crushed Weetabix biscuit, and even though I had this almost 3 hours ago, I’m still feeling pretty full from it. There were pineapple chunks in the bottom of the yogurt and they were almost crunchy and so good. I really like this flavor. And pineapple and kiwi went together SO well. I think that should be made into a new flavor combo. They always have Strawberry Kiwi and Raspberry Kiwi flavors, but pineapple kiwi really works! I loved this yogurt and think I need to get over my fear of low-fat yogurt instead of nonfat. I seriously don’t know why I have this complex about it! Now I am starting to think about eating again but today has been so off. I have to go to the hotel tomorrow from 1:45p – 9p or so, and I’m planning to go check out a market tomorrow in Courthouse, VA. Tomorrow is the first day of the Farmer’s Market, and there’s also a bike vendor who comes with used bikes. The bikes are tuned with new tires and ready to ride, and I’ve been really wanting to buy one since my ride with my dad over Easter weekend. Keep your fingers crossed that I find a good one! Today is going by so quick because its my last day in the office until next week! Those waffles for breakfast held me over for a good 4 hours. I had them around 8:00am, and didn’t start feeling hungry until after noon. I had some good lunch to look forward to, so I didn’t wait too long after that to dive in. The star of the lunch was the leftover Mini Stuffed Peppers from last night. Yum. Very satisfying and veggie-rific lunch. For an afternoon snack, I was so excited to dive into the highly sought after Pomegranate flavor of Chobani. I’ve been looking for this flavor everywhere because I’ve heard such good things, but couldn’t find it. The people over at Chobani were kind enough to send me some samples and they arrived today! I wasted no time. This flavor is SO good! The yogurt itself is so thick and creamy, and there are actual pomegranate seeds at the bottom of the yogurt. It tastes like you’re eating them straight from the fruit. I tried to capture a picture so you could see the texture but it didn’t turn out as well as I had hoped. The seeds themselves are a little crunchy and are a perfect texture against the creamy yogurt. If you see this on the shelf at your grocery store, BUY IT. It is seriously so good. There are only 140 calories and 0 grams fat in the container, but it packs in 14 grams of protein. I just had it so I can’t say yet, but I think this will hold me over for a while. Yum, yum, yum. I’ll be doing a Chobani giveaway next week, so stay tuned if you love Chobani yogurt or if you haven’t tried it yet but would like to!